Hmmm looks like the can outlets are recombined into the single exit pipe? or perhaps the exhaust for one cylinder exits as per the traditional design and the exhaust for other cylinder exits out the rear to reduce the amount of bends. It's hard to see. Maybe something to create a "scavenging" effect? By combining the two, into one, you end up with less backflow and maybe better exhaust gas velocity and faster flow? Kewl. Saw that during the races and was curious about it as well. Whatever they're doing, they're finally on the right track with a convincing double at Laguna Seca, a power-intensive track. Sadly, the 1199 will still go down as having the poorest race record of any modern ('88+) Ducati SBK. Perhaps due to politics (or lack of influence over those politics), I don't think they will ever be the dominant force they used to be. Heading is " crazy akrapovic "
I think the two headers converge into one right before entering the left side can, exit out the front via connector to the front of the right side then through to the periscope exhaust. Bit in function like the Comp Werkes exhaust, but obviously mucho more refined. I think the external can shapes are as much for making it look like a production bike as anything else; who knows what the internals look like! [QUOTE=JeffD;218971]Kewl. Saw that during the races and was curious about it as well. Whatever they're doing, they're finally on the right track with a convincing double at Laguna Seca, a power-intensive track. Sadly, the 1199 will still go down as having the poorest race record of any modern ('88+) Ducati SBK. Perhaps due to politics (or lack of influence over those politics), I don't think they will ever be the dominant force they used to be. 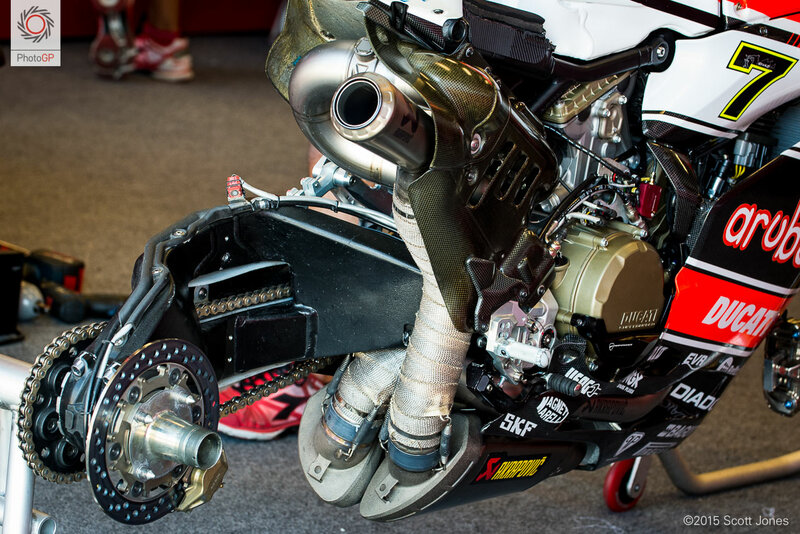 [/QUOTT Technology is getting better for all manufacturers thanks to innovating development from ducati and other successful teams as well as riders. have this system Canepa bike didn't and he qualified very well in super pole.